Welcome to our 15th episode in our new podcast series that’s all about tax delinquent real estate. We’ve done nearly 3,500 deals in 13 years through land and houses in this niche REI area and we want to share what we know about this specialty with you. Today’s episode is really Part 2 of our podcasts that are all about operations, which are crucial to implementing in your business so you can grow and scale your business. Today, though, we’re focusing on how to automate your operations by leveraging technology. Plus we’re going to look at ways to get clarity on your life and your life vision to aid you in getting those systems and operations in place. Intro: Are you ready to transform your financial future? Here’s your chance to see inside the mindset of self-made millionaires, Jack and Michelle Bosch as they go back the curtain on secrets that can make you rich. Discover how everyday people are breaking the norms and building empires from the ground up using a little low yet proven and time-tested wealth building real estate strategies. It’s my pleasure to welcome you to the ForeverCash.com podcast and introduce you to our hosts, serial entrepreneurs, investors, educators and best-selling authors, Jack and Michelle Bosch. Strap yourself in for the ride of your life. Jack: …With our Forever Cash Real Estate Investing Podcast. We are here today in episode number 15. And, episode number 15 is really part two of our operations podcast. So, last week, we shared with you how to set the foundation of your operations if you’re… I want to make sure if you’re a beginner, a beginning investor, what are the things that you need to look out? We talked about setting some pieces and putting together like for example, organization chat, putting the names of the people involved in your operations at different spots and probably your name all over the place, and then how to transition from that into a scenario where you have rules, procedures where you know what happens and what time and that you basically build almost like a template for your business so that when you hire people, they can actually go and start doing some of the things that we talked about already, right? So before we get started though, a couple of words about what we do here. Michelle: We do tax delinquent real estate investing. We have been doing this successfully now for 13 years. We started wholesaling land and also selling land on seller financing, and then wholesaling residential real estate, commercial real estate. And yeah, our area of genius within real estate has been tax delinquent real estate. We find that these leads are extremely motivated sellers where the properties have extremely high equity and we like that. We are able to purchase property for $0.25 on the dollar and we hope that we share as much as we can with you about how we go about doing that. And today, we are actually talking about operations. Like Jack said this is podcast number two or part two of this operations topic that we wanted to discuss. The first one was about operations from the point of view of a beginning investor or a beginning entrepreneur. This is one is more for an advanced investor. We are going to talk about a little bit more about automating and not just creating a system but automating it so that it is happening by leveraging technology. And, it’s happening whether you’re there, whether your team doesn’t have to remember that it’s happening because it’s all being automated. So, this is I think the focus of today’s podcast. And, just as a reminder, so operations are nothing to be scared of. Operations is nothing more than a framework or a structure that you create in order to be able to scale a business and be able to reach critical mass in terms of the number of deals that you’re doing. It’s nothing more than recognizing, “What is the end result that I am looking for?” and basically reverse engineering the systems or peeling back the onion to make those outcomes happen. So, the real estate business is really coordinating the aspects of identifying new areas, generating leads, receiving inbound calls, talking to sellers, putting properties under contract, closing on deals through title companies or by yourself. It’s marketing properties. It’s creating a buyers list. It’s closing on a deal on the selling side when you are selling it to somebody else. So, it’s bringing and really coordinating all of those different activities or mini projects and establishing priorities, and establishing deadlines and tasks that need to be done in order for those key aspects to happen whether they are happening through you or through VAs or people that are helping you with the business in terms of scaling it and bringing it to a different level. So, that’s basically what we are going to discuss today. And, I believe so deeply in operations because operations from my point of view are what will bring you freedom. We all start as entrepreneurs wanting to get into business because we wanted freedom of time. We want freedom of money. We want freedom of relationships and freedom of purpose. For some of us, we find the freedom of purpose later on, but for the most part, everyone starts by wanting freedom of time and money and without systems or leveraging technology to put those systems in place, that freedom is not just going to happen. You are going to be creating cash flow but you are not going to be enjoying your life and the whole point of walking this earth is being happy every day, living days and having days that are well-lived. And so, systems and operations are so crucial to enjoying that freedom. Jack: …Most in life? What good is it to be a billionaire? And yeah, you get to fly in private jets and stay in five-star hotels and things like that but at the end of day… Even Sam Walton on his death bed basically said, “I blew it.” Now, what did he mean by that, “I blew it”? What he meant was he basically didn’t live life. He didn’t see his grandchildren grow up. He probably didn’t see his own kids grow up. He was so focused on creating a big company that yes, he had systems and so on, but that he forgot about the most important thing in life which is in our humble opinion, our families. That’s why we run this podcast together so we get to spend more time together. That’s why we usually are done working at 3:00 in the afternoon and you mostly, at least. And sometimes, I put a little few more hours in the evening once our little daughter is asleep, but such that, when she comes back from home, both dad and mom are at home, or actually, we pick her up from school and we can go have an ice cream or we can hang out there. We go bicycling a little bit. We help her with homework. And then, if there is still something that needs to be done, because it’s a deadline or something like that, then we work on that, but it allows that freedom and that flexibility and that’s only single-handedly comes from systems. Michelle: Yeah. So, we’re at the point where if you are listening to this, either you’re a beginning investor or you’re an advanced investor and you are doing quite a bit of volume a month and if you are not there, you are wanting to get there. So, in either case, the beginning point should be in order to create this freedom of time and in order to get clear, to get clarity on what matters, on what is the heart of the matter of why you’re doing this business. So, once we have these five lifetime goals and this key foundational goal that if we did this one thing, all the other four would fall into place, I want to talk to you a little bit about a couple of principles that we learned a while back with Jack and that is, I want to talk about the principle of effective implementation. So, this principle says that fuzzy targets don’t get hit and that we need a target, a vision of what we want our life to look like and hence the need or the exercise that I gave you earlier about the five lifetime goals. So, going back to the principle of effective implementation, what this means is that we need projects and we need targets and they need to be organized around a congruent life vision: a vision that we have for ourselves, of our life. Not where we retrofit life into business, but where we retrofit business into life, the life that we want to live. And so, in order for us to be able to enjoy, like I said earlier, those freedoms of time, money, relationships and purpose, we want to start looking at things from this point of view, from this angle because the business is nothing more than a reflection of the state of affairs, the internal state of affairs of the entrepreneur. So, we want to get clarity on our internal state of affairs so that there is clarity for our life, for the vision that we have, for our businesses. So, we first need clarity in our life vision in order to have clarity in our business vision. So then, the second principle that I wanted to share in this podcast too was the principle of limited focus. So, this principle says that we need to selective, that actually doing less is the key to accomplishing more. And so, this is the principle that says that you need to basically guard and refuse to sacrifice the important for the unimportant and to keep the main thing the main thing. And so, as you look at this principle, you’ll probably start identifying either ways of being or activities that you really need to stop doing because they are taking up energy and space in terms of not letting you enjoy freedom for the things that matter or not giving you the space to say yes to the things that matter when those things actually show up, when those opportunities actually show up. So, I know that this is a different way to look at operations, but I think it is mission critical for every entrepreneur to look at it from this point of view where you get clarity first on your life vision, then in your business vision. And, you start basically, once you have clarity on what those look like, you start basically removing, cutting off all the noise in the clutter and focusing on the things that actually do matter. Jack: It is a hobby. It might be a very profitable hobby. You might make $20,000 a month or make a quarter million dollars a year, but at the same time, it’s still a hobby. If you want to take this to another level and do four, five, 10 deals a month, you need to have systems in place, but before you have those systems in place, you really need to think about what Michelle just talked which is exactly, “What are your life goals?” because otherwise, you do what everyone else tells you to do which is running in one direction as fast as you can and building growth, growth, growth. And, growth is cool but growth needs to serve a purpose. Jack: And purpose, less growth is just more activity that is going to make you tired. So, therefore, I know we’re taking a little bit of a different approach of business here, but I think it’s a very important approach of introducing meaning to the worth of growth. And basically, you are adding the word meaning in parallel to the worth of growth. So, therefore, if you want to grow, ask yourself first, “Why do you want to grow?” Well, because you want to make more money. Okay, great. So then, if money is the goal, then ask yourself, “What do you want to do with that money? Do you want to also have the time?” So, yes, if you want to have the time and the money, then therefore, now you’re getting a bit of grasp on how you need to design that growth such that it doesn’t eat up more time and only give you money or it doesn’t eat up the money and it give you no time because there are plenty of business owners that have no time and no money that just look good on the surface. So, therefore, you want to make sure that you consciously build your systems around that you have both. Michelle: Uh-huh. And so, once you have clarity on this, then you can start thinking about your wholesaling business, whether it be land or houses. And then, you want to start looking at all the different areas and, I think, we alluded to this already in the first or part one of this podcast, which is you want to start looking at all the different functions that you have right now. And, they can go from identifying new markets to acquiring lists in those new markets, processing those lists, processing mailings, servicing inbound calls. And, for all of these, when you’re looking to scale, you’re going to need templates and standards so that either the aids or people that you hire or companies or contractors that you hire know exactly what the expectations are, what they need to be doing, and so that they can deliver to you their part of all of these functions in the way that you needed to be and in the quality that you needed to be. So, for example, if it’s about mailings and you’ve decided that you will no longer take care of mailings, mailing houses is the way to go. And, you want to basically, once you’ve process the list… Perhaps you have somebody else that is processing the list for you already at this point. You want this person to basically chunk and plan out for you the next six to eight weeks of your mailings and you want to ideally already schedule them with the records, with your mailing house so that you think about this once at the beginning of the quarter and you don’t have to think about this anymore for the next nine to twelve weeks. So, I wanted now to take a step back and go and talk about… So, we talked about you know the lifetime goals, the vision, the life vision, the business vision, the principle of effective implementation, the principle of limited focus. And so, what I want to introduce to you now is something that is called “Structured Rhythm of Success,” a concept that is called “Structured Rhythm of Success”. And, what this means is that once you have identified your life vision and the vision for your business, you start thinking about, “Okay, this is my vision. These are my lifetime goals. This is my key foundational goal. What of these goals can I bring in to the next year?” And basically, from that, decide, “This is what my focus this year is going to be,” and it could be a set of two or three goals within the year where you balance out, like I said, personal and business and you start thinking about, “Okay. So, this is what I want to accomplish within the year.” But, a year is a long time. It’s 365 days that when we start thinking about them, it doesn’t seem like a lot, but we can get lost within that year. So, you start thinking in terms of quarter. And then, once you start thinking in terms of the quarter, “These are the three mission critical things that I need to do this quarter,” you can start thinking about, “Okay. What do I need to do monthly?” And, if we continue down the level of focus, “What do I need to be doing weekly?” And, if we continue down that level of focus, “What do I need to be doing daily?” because daily is where we step in to that life vision. This is where we actually live out that vision or that point in the future and we live it on the day. And so, there are certain things that we may need to stop doing there. A lot of mental patterns show up in the day that sometimes sabotage our success and sabotage that vision that we have of our life and our business. And so, we want to bring some consciousness and start examining some of these things not just out there as abstract, but in timeframe and bringing it down all the way from the life vision, all the way to the day. And, when you’re in the day, that’s where you start looking about chunking time like we had discussed in part one of this podcast which was chunking time where you define certain days to be devoted to certain activities. For example, we have what we call “buffer days” in which we prepare and plan to have amazing focus days and focus days are days in which we focus only on generating activities. These are things that will bring new leads to our real estate business or making offers that will turn into deals or identifying new areas to go and new markets to invest. So, we chunk our time in different types of activities at the daily level. But, if we go back out the quarter… I want to say the quarter is a formidable time frame to start basically extending your time horizon because it’s very easy to get overwhelmed as well, overwhelmed in the day and to be lost in days and in weeks and even in a month. But, the quarter is a formal timeframe and that is it’s not too long. It’s not like the year. It’s not so short, but it gives you three key things or blocks. If you identify what those three key blocks are, these are things that you want to accomplish. And so, what you find is that by extending that time horizon, you are able to plan. You are able to anticipate things, dangers, opportunities, the strengths of you as an entrepreneur and of your business and this will incredibly enable you to bring momentum into your business and into your life. And so, once we go back out to this quarter, what you’ll find is that the operations aspect is going to turn more into something of planned repetition and repeated planning where every quarter at the beginning of the quarter, you basically repeat a plan either if it’s not completed yet from the prior quarter or you set up a new plan for the new quarter, an entirely new plan. And so, like I said, it’s repeated planning and planning in repetition and you schedule these things, these meetings with yourself or with your business partner if you have a business partner or if it’s your spouse that is your business partner. Like in our case, we work together. So, we set these quarterly meetings for ourselves and we even have monthly, weekly meetings with ourselves and with our team to make sure that the momentum of our wholesaling business is where it needs to be because that’s our job as the leader of the company. Jack: Because 90 days… To jump in here, I’ll give you a little relief here. You’ve shared all this amazing information. The 90 days is a great time period for stuff to be fairly accurately planned but still long enough to have some wiggle room for things to change. Jack: And, things will always change. So, therefore, setting up a 90-day plan is not something that you will have to do every single item exactly like it is on those 90 days. If you are working in a very boring business, it might actually… A very predictable business and boring is very good in business, by the way. I mean, there’s a compliment. If somebody has a boring business, that’s awesome because that means they have the systems in place and they have the procedures in place and they have their… Everything is planned down. Michelle: And, the business has gone from being an idea or the chase of an idea that entertains the entrepreneur to something that actually sustains the entrepreneur. And so, in this way, boring is great. Yeah. Jack: Right, exactly. So, 90 days is a plan that put together and even though you might say, “But, Jack, I don’t know what things are going to happen in 90 days.” That’s okay. The thing is, when you set or put together a 90-day plan, you are starting to put things in place to make sure that the things that you want to happen are actually going to happen. So, it allows you to adjust for that month for that quarterly goal, and then really crank things up in the next month or right away so that you can actually still reach those goals. So, the 90-day goal and that’s actually funny, everyone makes five years or one year goal and things like that and not taking into consideration how much change is around you, but as you break them down, there’s still wiggle room. That’s my message. So, if you’re like me, who basically… I operate best in like improvising environment, and then what’s the most important part to me is that while I have a plan… It’s very liberating to have a plan, that I still have some flexibility within that plan to actually make things happen because it’s in that flexibility that I thrive and it’s in the predictability that Michelle thrives. Jack: So, she… So, therefore, by having a plan that actually has some legal room, we both have what we need in order to be successful for our business. Or, somebody in the conversation came out with another piece of information that we’re like, “Oh! From now on, we need to ask for that too.” So, we started making a list of questions that we need to ask and we came up with a list of 16 questions. So then, we started saying like, “Well, let me not forget this on an ongoing basis. Let me put this into a piece of paper.” So, we have a piece of paper and we printed out that piece of paper a thousand times or a hundred times so that we have them all over the house and when somebody would call, we would grab a piece of paper. And then, we would start losing these pieces of paper, and then we put like a central place in the house where we put like little folders. Jack: …In a very, very non-technological way, in a very simple way. And afterwards then, we started hiring people and we continued that process in a paper basis and soon enough, people would call in and ask about the status of their property and we really didn’t know. So, we looked for the paperwork and we couldn’t find it. And then, we found that it had fallen behind a desk of one of our few employees and basically, nobody had dealt with the deal or some of the employees was a hacker and basically hacked all these files and forgot about them and so on and so forth. Soon enough, we realized, “We can’t operate that way and we can’t keep scaling.” So, we hit what we call at that level our ceiling of complexity. Jack: So, we hit the complexity that our paper-based system was built for. 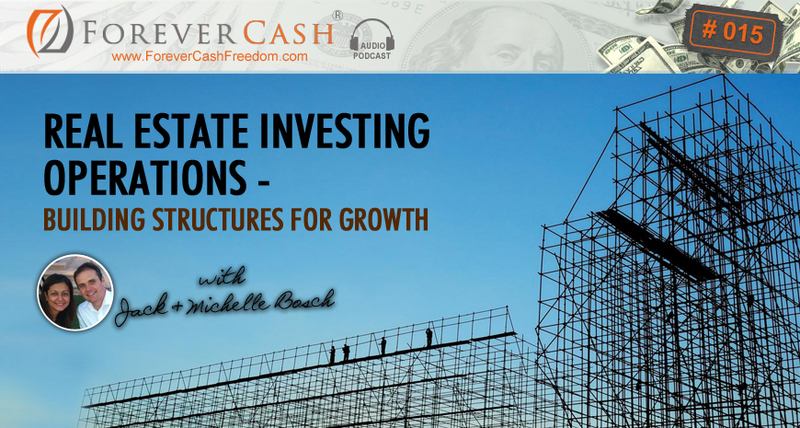 Michelle: Is it the Investment Dominator? Jack: No, it’s not. But, if you want to talk to us, I think it’s application or something like that and JackBosch.com/Application or ForeverCash.com/Application. If not, well, if you write it that down… By all means, what I would suggest you do is you go to the meeting notes of this podcast which is actually located at www.ForeverCash.com/Podcast. And, there in the meeting notes, we put the correct link to the place where you can apply to talk to us, to see if the Investment Dominator is the right tool for you or if our coaching programs are the right fit for you. By all means… Obviously, you don’t have to. Michelle: Let’s go back to the paper one. Michelle: Well, prior to that, we had an Excel spreadsheet. Jack: Right! We went to an Excel spreadsheet. Michelle: And then, we had a shared sheet, and then we realized that there are several people that had access to that spreadsheet and the accuracy of that spread sheet could not be … The integrity of the accuracy could not be really maintained. And then, we’re like, “Okay. We need to really evolve from the spreadsheet into something where we can have more of tasks associated with each of the difference steps and functions, but also, hierarchy as to what a person can do with the data depending on the hierarchy that they fall into. And so, that’s when we decided to go and look for a customer relationship management software that basically could give us that new level of growth and flexibility. And, basically the software was creating that foundation and that framework for us to grow and basically hit our next level of complexity and so on and so forth. Jack: All right. Yes, exactly. So now, after the spreadsheet which had its numerous issues. Jack: Which works if you’re a one-man show or if you’re two people in your business, then it might work. But, we had like eight or ten people working on this spreadsheet and they even got corrupted in between and we had to recover. It was a nightmare to work that way. So, we finally realized that we need something that’s web-based that everyone can access from anywhere in the world, that we can have different statuses in there for where the properties in there, that we can built in a little workflow in there. Jack: We can take a property from stage to stage and most importantly that we can run reports on. Michelle: Yes, the most important! I was going to say reporting. You want to basically design. When you’re ready to move on to a customer relationship management software of some sort, you want to design and the “Investment Dominator” is already designed to create the reports that are most pertinent in both purchasing and in the selling of land and homes. And, those are reports that are based on close of escrow or dates because you want to stay on top title companies to make sure that you close before that time frame or close of escrow in terms of selling the property and make sure you follow up with your buyer so that everything is happening like a clock when you’re selling the property and so on and so forth. Jack: Yes. So, with that, we then basically went to this online system and started building that out. There are multiple options out there. As I said, one is the Investment Dominator and the other one is one that… For example we call… There are systems out there like Podio.com. Again, it’s P-O-D-I-O.com, which is basically free, but you get a free shell for it and if you want any kind of functionality with it, you end up paying a certain amount per user for it and so on. And so, if you have multiple people, it might easily end up costing you a few $100 a month to run this plus an implementation effort and so on and so forth. And then, the next status is “Offer made. Waiting for acceptances” and so on. The next stage afterwards is then either “Follow up. Offer sent,” if nobody answered or if nobody accepted the offer or perhaps it’s “Offer accepted. Escrow initiated” or “Escrow opened.” And then, there might be a special status in there that says something like “Title issues and escrow extended” or something like that where we need to do more research. Jack: …Because you don’t want to lose properties or because of an expired contract. Michelle: Or, say Tuesday comes around and you have decided that Tuesdays are going to be your days in which you’re going to make 100 offers all at once. You want to able to identify very quickly by running a report all the properties that are ready in that stage, that have been researched by somebody else already and they’re ready for you to just basically prepare an offer for them. Jack: Right! So, bottom line is, if you do this properly, you have almost like… You can even run reports on the amount of properties in the different stages. And then, you can see if they have a lot of properties that are in the selling or sold stage with a very few in the beginning stage, then you need to crank up your marketing. So, it even allows you to do a business cycle tool. It allows you to even plan forward for your business by seeing where are the bottle necks and where are you or your majority of deals because you might be all busy selling properties, but there is not enough coming into the funnel or coming into your door. So therefore, you can see that too by running reports. Michelle: It gives you all that visibility. Michelle: You’re trying to land the plane without any of the gauges or without looking at any of the gauges. Jack: You’re the pilot of your plane without having any of your gauges and obviously that’s no fun so you don’t want to do that. All right? Okay, so, with that, as always, I want to recommend that if you enjoyed this podcast, go to iTunes. Go on your iPhone and rate us. There are two different ways to rating us. One is the one to five star rating. Obviously, the more stars, the better. And, the other one is to actually leave a feedback on there and we would love for you to do that. And, obviously, I haven’t mentioned that, I think, in this podcast at all. If you go to ForeverCashFreedom.com, you’ll even get a free tax delinquent real estate course which shows you the five different techniques that we use in our business to actually get all these deals done and to build that moment that allows us to put the organizational system in there that we just talked about. So, with that, I want to say thank you very much and buh-bye! Michelle: Thank you very much. See you guys in the next podcast. Outro: Thanks for listening to the Forever Cash Freedom Podcast. Subscribe now for future content-packed episodes on how to push the ejector seat on your financial hamster wheel and discover our radical way to freedom and wealth through cutting-edge real estate investing strategies. To learn more about living the “Forever Cash” lifestyle, investing smartly and becoming financially free, visit www.ForeverCashFreedom.com to claim your free “Forever Cash” Starter Kit today!